It is not every day that a group of children get to have a private Q and A session in the House of Commons or hear tidbits of personal wisdom about life and career from policy advisors, Ministers, Members of Parliament and the Prime Minister himself. But on February 28, a group of children from elementary schools in Toronto and surrounding areas got to do just that – and more. 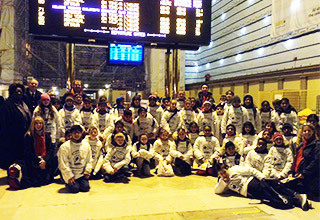 The students caught the train to Ottawa – Via Rail provided tickets for two train cars for students and their teachers – where several elected officials had carved out time to host and speak to the children as part of this year’s Black History Month celebration. Known for serving nutritious meals to children attending its clubs, the Children’s Breakfast Clubs organizes this trip annually to provide children from its programs with lessons outside the classroom. By connecting them with elected leaders at Parliament Hill, the trip aims to help kids learn about governance and leadership and to celebrate the contributions of the Black community in Canada. For most of the children, it was a day of “firsts:” first time on a train, first time on a long distance trip, first time to Ottawa, and first time to visit the Parliament buildings. Accompanying the children to Ottawa were the Hon. Jean Augustine, staff from Historica Canada, Zubeda Nanji and Richard Gosling of the Children Breakfast Clubs, and five members from the Toronto Paramedics who were being recognized in this year’s Black History Month poster. Aboard the train, the children were occupied with activities and history lessons on immigration from staff of Historica Canada. They also learned about the work paramedics do. 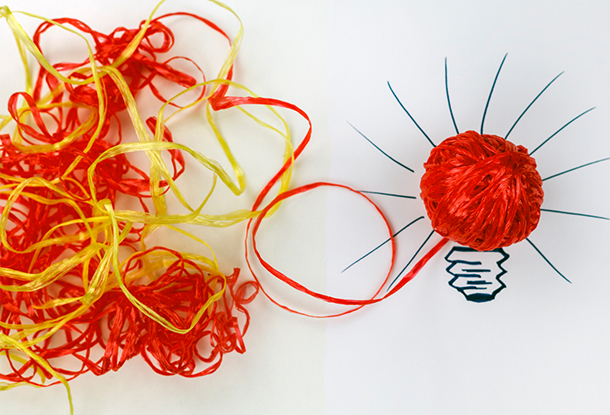 These lessons on leadership and diversity were a recurring theme for the day. The children kicked off their visit with guided tours of Centre Block – home to the Senate, House of Commons and Library of Parliament. After the tours, the children assembled in Room 237-c for the presentation of the Black History Month poster. 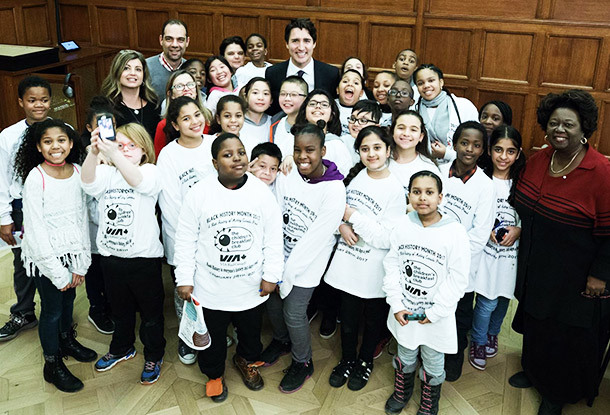 The children were hosted by Prime Minister Justin Trudeau, Minister of Citizenship and Immigration, Ahmed Hussen, and MP for Hull-Alymer, Greg Fergus. As Minister Hussen took a moment to welcome the children, he reminded them that they each had the opportunity, capacity and potential to lead in their communities, cities and country – a country with limitless opportunities. Continuing with this theme of leadership, Prime Minister Justin Trudeau challenged the age-old idea that children are the leaders of tomorrow. Instead, he encouraged them to view themselves as leaders of today. He explained that they demonstrate leadership in the things they do at home and in the community every day, such as tutoring, recycling, and organizing after school activities. He emphasized to the children that these “small things” are significant; they make a difference and have an impact on the communities they live in. The Prime Minister also addressed the importance of embracing and celebrating diversity by thinking about our differences and finding value in them. 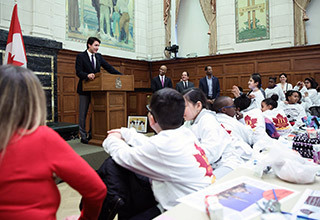 As a generation that is experiencing unprecedented diversity in their schools and communities, the Prime Minister explained to the children the significant role they have in effecting positive change by sharing their knowledge and understanding of diversity with those people who are older but lack this experience. After the speeches came the group pictures, and then the children proceeded to the House of Commons, where Ali Ehsassi, MP for Willowdale, and Senator Jim Munson led them in brief lessons on the House of Commons. The children also got to demonstrate their own knowledge of government in a Q and A period. 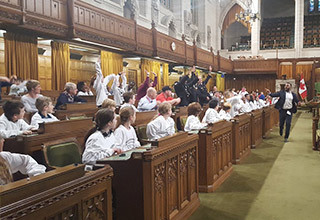 The day wrapped up in a memorable “House of Commons wave,” led by two young political staff, who provided the children with brief accounts of their own journeys to Parliament Hill and a road map on how they too can get there. As the train left for Toronto, the children chattered away. Perhaps inspired, perhaps still excited, the children recounted their favourite parts of the day: seeing Prime Minister Justin Trudeau and having a picture taken with him, watching the sunset on the train back, looking at the sergeant of arms’ sword, visiting the House of Commons and the library. Each child had their own favourite experience and took home different memories. 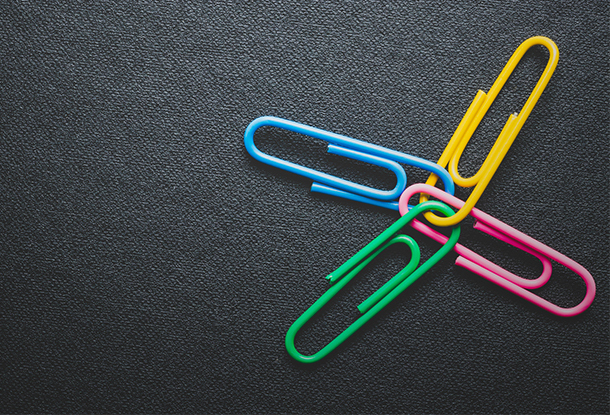 But in my view, the most significant experience was that they had been there, that they had access to leadership, and, hopefully, now see in themselves the leaders they can be – and already are. This trip offered the children a vision, a road map even, on how to get there. It showed them that they too can be a part of the bigger picture and effect positive change. Valentine Muigai is a Communications and Project Assistant at Maytree. A group of elementary school students take a trip to Parliament Hill, where Prime Minister Justin Trudeau, Ministers, MPs and Senators, talk with them about leadership.